I am a frequent reader of major Swedish news media like Dagens Nyheter, Svenska Dagbladet, Expressen and Aftonbladet. However, I always start with The Independent, The Telegraph, The Guardian and Der Spiegel. 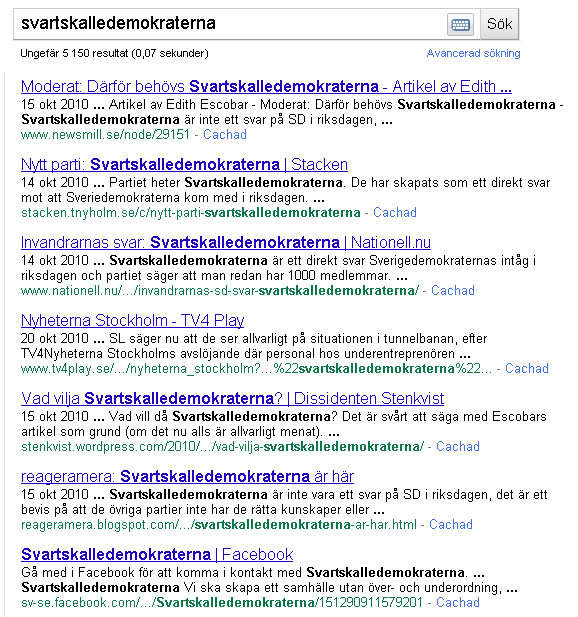 On October 26, Der Speigel reported about a new political party in Sweden: Svartskalledemokraterna. Roughly, "The Niggerdemocrats". Der speigel translated it to "Wog Democrats". This news is vital in itself to understand what is going on in Sweden. But what becomes even more interesting is that a major German media, and NOT leading Swedish media, write about it. Der Speigel: Rampant Racism? New Political Party Aims to Scupper Sweden's Far-Right Following the success in September elections of a far-right populist party in the country, a Swedish immigrant has formed a party working to protect immigrants' interests. The new party is being founded amidst a wave of violent crime against foreigners in the southern city of Malmö last week. 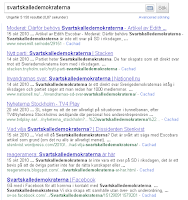 - An article on the blog service Newsmill that is partly owned by Dagens Nyheter...at least it was. - In TV 4, regional news “Nyheterna Stockholm”: 15 okt 2010 ... "Svartskalledemokraterna" bildat i Rinkeby. torsdag 14 oktober 2010. That is all except for blogs and forums. Time and time again, silence is blatantly used as an obvious cover up that only serves and protects what is established. The Swedish political class, including their loyal journalist serfs, pretend that it is important to "integrate" immigrants. Which in this case means to integrate “them” into The Swedish Silence. In April 2009, Svenska Dagbladet said openly, in an editorial, that they did not intend to write about news that they did not like...This journalist is now a member of the Swedish parliament. Men urlen är densamma: www.staten.co.nr som tidigare. The Hyperpicture reveal the decline and fall of the western mindset (command and control / static logic) and the upcoming culture of understanding and dialog.